I am someone who leaves the house with the most insane amount of stuff. I’ve always been like this. Regardless of the size bag I’m using, you can be sure its full. The other night I wore a dress with pockets so didn’t use a bag. They were filled to the brim of course! 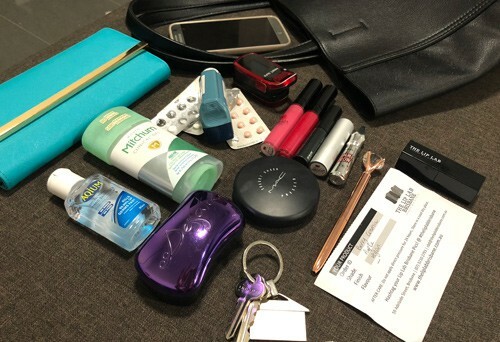 Today I’ll be sharing the essentials I always have in my bag. I have a million bags but only one purse. I could not be bothered changing out all my cards. There are just too many. My purse is bright turquoise blue and was on sale from Colette. I am so in love with the colour I couldn’t resist it. Absolute essential! I can’t stand not being able to clean my hands after touching trolleys, bathroom doors etc. And if I cant wash my hands before I eat… yuck! I am a very anxious person so never leave home without my medication. Even if I don’t need them, it gives me piece of mind and helps me to get through the day without worrying about ‘what if’. This is quite new for me. I was always getting caught out, important phone calls and nothing to take messages with. I still don’t have paper though… so I write on my arm. I always, always have a brush with me. When I was 13 I got yelled at for having messy hair at school. Since then its been a must have. Thanks to Desatta, I have a cute little brush with a cap so the bristles aren’t damaged and hair doesn’t go everywhere. I currently have 3 lipsticks and 2 glosses in my bag. Obviously, I need them working in a makeup store but I am never without at least one lippy. Never know when you’ll need a touch up. I keep a MAC compact with me. It’s minimal coverage but gets the job done. Great for those hot days when you sweat your makeup off too. I couldn’t leave the house with out it. Emails, social media, camera, calm app, audio books, games… seriously, I would be lost! The picture below is of my bag and everything I currently have in it. I haven’t taken out or added anything. This is exactly what was in there.